We believe our study skills book, The Complete Idiot's Guide to Study Skills, by Randall S. Hansen, Ph.D., and Katharine Hansen, Ph.D., is the best study skills and academic success book on the market. We wrote this book to be your guide -- your companion -- to achieving greater academic success, to achieving the success you desire -- and, ideally, without you having to make great sacrifices or changes to do so. Our agenda with this book? Simply put, we want to help you succeed in school; we want to empower you to achieve the success you desire. We want you to view learning not as a struggle, but a success. We want you to not only become a better student and develop an appreciation for learning, but also use these skills to move forward with your life and career beyond college. This book will help you break bad habits and establish new ones. This book is organized in five parts around something we call the TEST Method, a guide for developing solid study skills. What does TEST stand for? TEST is not some simple system for improving academic performance. Rather, it's a philosophy of becoming a better student that results in smarter study skills and higher performance in the classroom -- a philosophy that you can incorporate into your life. Part 1, Pre-TEST: Laying the Groundwork, focuses on clearing the air about academic success while preparing you to succeed by examining study myths, rules for improving your grades, and study tips from top students. Part 2, Taking Responsibility for Learning, highlights the information you need to understand about yourself -- and methods to improve any deficiencies -- before you can achieve greater academic success, including time management issues, finding your learning style, and reading strategies. Part 3, Establishing Success in the Classroom, stresses the tools you need to succeed in school, with special emphasis on four areas: class preparation and note-taking, study tools, testing techniques, and special techniques for key subject areas. Part 4, Succeeding With Writing, spotlights the importance of writing in achieving academic success, and covers such key issues as research methods, writing essentials, and success with specific types of writing assignments. Part 5, Tackling Tough Issues, provides you with solutions to some common problems students face when attempting to improve grades, including ways to manage stress and achieve balance as well as tips for times when your grades are not improving. As you work your way through the book, you'll encounter some extra bits of information that we believe you will find helpful as you attempt to improve your study skills and achieve better grades. Study Suggestions: Concise and useful tips and ideas for helping improve your grades. Study Stories: Short anecdotes and inspiring words from real students who have achieved academic success. Self-Study: Informative and brief assessments you can take to judge your understanding of the material. Study Stressors: Activities, habits, and other things you'll want to avoid. 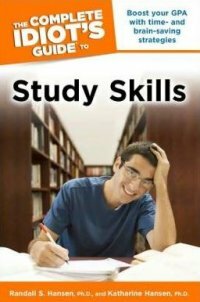 Looking for other study skill and academic success books? Our Academic Success Bookstore, in association with Amazon.com, contains editor-picked selections of the best books to help you achieve greater academic success.